Trick photography? Hardly. But once you witness The Exchange in action, you’ll swear that either a supernatural force has possessed a deck of cards or you’ve witnessed a bona-fide blip in the fabric of reality. 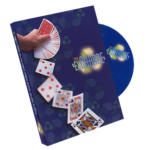 The Exchange allows magicians to perform miracles – effortlessly. Imagine outjogging a card from the pack and visibly changing the color of its back or face – without sleight of hand. And much more – all without difficult sleight of hand. Perhaps best of all, The Exchange can be set-up in any deck of cards without suspicion. The gaff is cleverly disguised in such a way as to be absolutely undetectable, even to spectators who scrutinize your every move! This is a devilishly clever card utility you’ll put to work immediately.